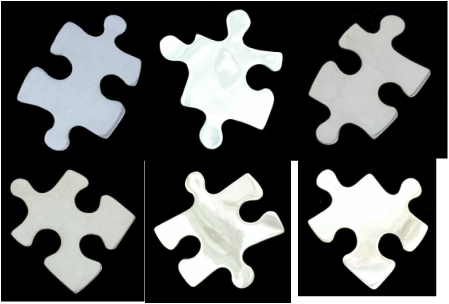 A set of 6 jigsaw brooches. It's not the first time that I have made jewellery based on jigsaw puzzle pieces, but I was quite surprised when I was asked to make these 6 brooches. So many! But I'm hardly going to turn them down, am I? Not when it's one of my best customers. I believe that they were to be given as Christmas presents to a whole group of jigsaw puzzle lovers. I hadn't realised that jigsaws were still so popular, but I'll admit a penchant for them myself. Penchant? I have been known to stay up all night doing them, distracted only my the light of dawn. Not sure I could tackle a 2000 piece monster. Not in this silver pattern, anyway.